Caramel Apples good enough to eat on their own! 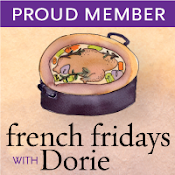 This week’s French Fridays With Dorie challenge is Rice Pudding and Caramel Apples. We also made the optional Warm Caramel Sauce to go with it. This French version of rice pudding is so smooth and creamy – far different from its American cousin that’s made with an egg-based custard. Surprisingly, the quickest and easiest part of this recipe was the Warm Caramel Sauce – which you can just think of so many uses for! 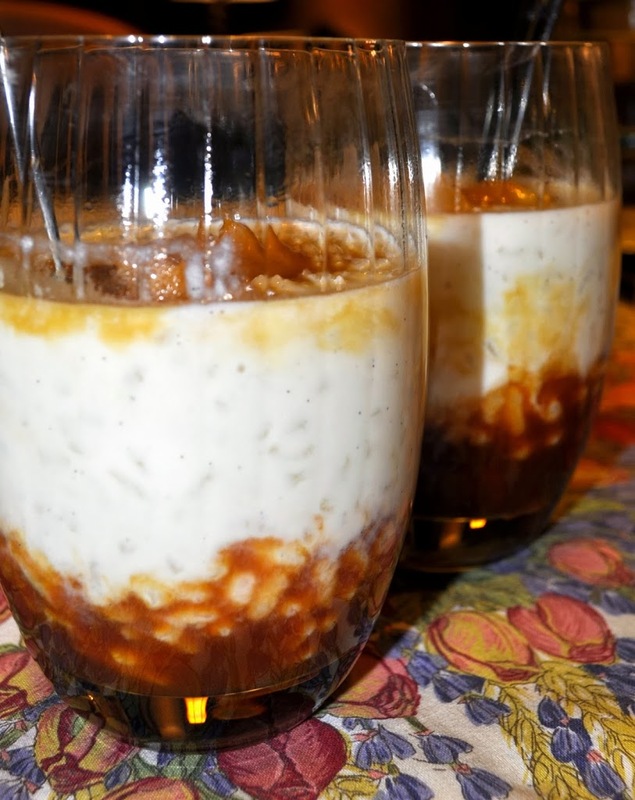 The rice pudding is made with arborio rice and the process involves boiling it in water, straining and rinsing it, then boiling it again, in sugared milk for about 35 minutes. 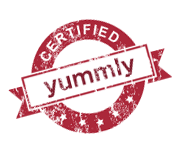 Its high starch content allows the milk to become thick and creamy. Although it takes awhile to make, it’s worth the result. Imagine this creamy pudding scented with vanilla layered with homemade caramel sauce and caramel apples – it’s Autumn in a glass! 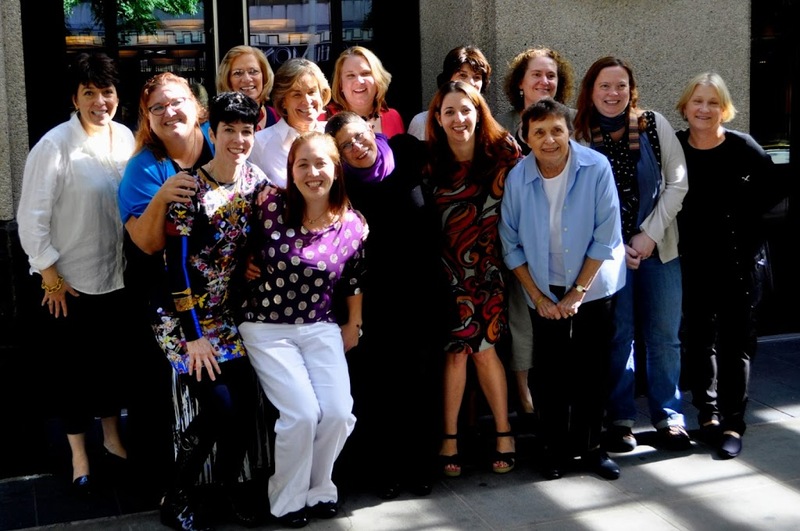 Dorie surrounded by Doristas at the International Food Bloggers’ Conference in Seattle! So funny Susan, I’m sharing a pudding with apples too! Very different but underneath the same 🙂 Looks like a fun time at the conference. I know you all had so much fun getting to know each other! That looks soooo good. I want to stick my face in it. I’ll try to knock this one out this weekend. I’m so happy apples are in season! Even though rice pudding is not my jumping-up-and-down favorite, everything is better with caramel and apples. Driving next to miles and miles of orchards just yesterday is also a big inspiration. 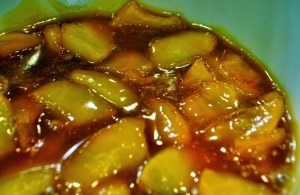 My caramelized apples were kind of a fiasco…so glad to know it was just me and not the recipe. I love that last photo…I hope you don’t mind that I pulled it from facebook and added it to my post! Thanks to you and John for taking such wonderful photos!!! What a wonderful photo of all of you. It seems like you all had so much fun! And I love the deep caramel colour on your rice pudding. I might just make the caramel apple alone sans rice pudding. This was a delicious dessert. Thanks for sharing your pictures of the conference. Such a fabulous dessert, I love the caramel sauce! That sounds heavenly! I’ve never done anything this exciting with rice pudding before…it actually gives me a ton of ideas! Love the photo with all of you and Dorie! How fun! 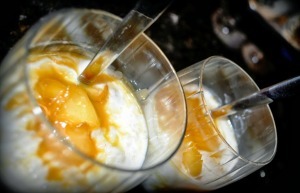 Your carmel sauce looks incredible.. glad to hear you enjoyed both your trip and the dessert. We just got back from a drive up through the Adirondacks and let me tell you – autumn is here! I wish I had some of this in my refrigerator waiting for me – especially since all that is in there right now are condiments. Time to restock! Interesting. I don’t think I’ve ever tried american rice pudding so I had no idea that it was different. And I agree with you about the caramel sauce. I luckily still had some in my fridge from the floating islands and it was delicious! I love your presentation of this pudding parfait in glasses, Susan. My favorite part of this was the apples. It was so wonderful to meet you and John last week. What a special weekend for all! I’m still smiling about it. Thanks for all your planning of such a successful meetup. The pudding was tasty, but the apples were delicious. Pretty presentation. I’m hoping to get this one done this week. I wasn’t going to do the sauce but it looks so good here I may have to. I love that this is autumn in a glass! I added some fall spices to mine and it was especially Fall-ish 🙂 Great job! Love both components of this recipe, yours look very enticing! “Autumn in a glass” – perfect tag line !! Lovely job on this and your coloring to the apples is especially pretty. I must have chickened out and not done mine hot enough or long enough as they stayed fairly light, but still tasted yummy. And great pic of the Doristas 🙂 I had SUCH a wonderful time meeting you and John- I truly enjoyed the company and the travel tips as much as the cooking tips. You guys are FABULOUS. 1. Yum! 2. How cool to see you and the Doristas with Dorie! I really don’t want to bother with reading your Post, Susan, I just want to look at your lovely pictures. So I am sitting in bed, it’s 5am, and I am tilting my head left and then right and then tilting the computer left and right. Your opening photo is super good. Although I wont make the rice pudding again unless I receive a request for it (I’m still a tapioca girl – thanks, Mom), I will make the caramel sauce again and again. I do think I should have cooked the sauce longer because yours is far darker than mine. Still I believe caramel belongs with apples and a stick! Your pudding and apples look very tempting in your pretty glasses! We loved all of this but especially the caramel apples! I enjoyed meeting you and your husband and look forward to our next Dorista event! I finally got around to making this pudding recently – your version looks great. And I love the photo of you all at IFBC.